An interview with US Ambassadors of FLITE (Female Leaders in Tech Everywhere), Michelle Ogihara and Sherry Stepp on the subject of women in electronics and FLITE's mission to build a platform based on real-life experiences to help raise the visibility of females in technology. In the last half of the 20th century, cleaning of circuit assemblies was a standard assembly practice. The abolishment of popular CFC-based cleaning solvents ushered the introduction of "no-clean" assembly processes. For much of the electronic assembly industry, cleaning became nonexistent. Due to assembly and component miniaturization and the explosion of both IOT and automotive electronics, which places many circuit assemblies into harsh environments, the practice of removing harmful ionic contamination from circuit assemblies has once again become a mainstream practice. Today, the majority of electronic assemblies are cleaned. And, for many assemblers, cleaning is a new process. Brad Griffin speaks from CDNLive to PCB Chat host Mike Buetow on the new electromagnetic (EM) simulation tool from Cadence. Brad describes how the Clarity software reads design data from all standard chip, IC package and PCB platforms, integrates with Cadence's platforms, and has won plaudits from key customers for its speed and accuracy. X-ray has come a long way since its discovery in 1895. Originally used in the medial field, X-ray technology has been integrated into many industrial sectors including the electronic assembly industry. Dr. David Bernard is an expert in x-ray technology within the electronics industry. 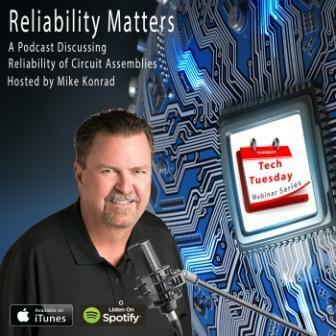 Dr. Bernard discusses the modern use of x-ray technology, applications within the electronic assembly industry and the skills required to interpret the images produced with Reliability Matters host Mike Konrad. Leah Slaughter is vice president, supply chain and artificial intelligence programs, at Varitron, a multinational EMS company. She has been in the industry for more than 20 years with Future Electronics, SMTC, BreconRidge, Sanmina, Celestica, Jabil, and most recently SigmaPoint. She explains how artificial intelligence is being used today to improve electronics supply chain management, how to adopt and implement AI, and the software provider she prefers best with PCB Chat host Mike Buetow. Mike Bixenman is one of the founders of Kyzen and serves as its chief technology officer. He is well-known within the electronics assembly industry and is a featured speaker at industry conferences and symposiums around the world. He is chair of the IPC Cleaning and Coating Conference held every other year in Chicago and is the technical chair for SMTA Europe’s Electronics in Harsh Environments Conference held annually in Amsterdam. He also received the IPC President’s Award and has chaired the IPC Cleaning Handbook Task Group. "Bix" talks with host Mike Konrad about cleaning for reliability, challenging components and fluxes, methods to determine how clean is clean enough, and how and why he cofounded Kyzen Corp.
PCB Chat host Mike Buetow catches up on the weekly news in electronics manufacturing. This week: New electronic material discoveries, expansions in Southeast Asia, company earnings reports. On this episode, Mike Konrad hosts a roundtable discussion on the subject of cleaning circuit assemblies after reflow. After all, contamination removal is exclusively performed to increase the reliability of circuit assemblies and the products they are installed in. With the rapid expansion of electronics due partly to automotive and IOT, cleaning of circuit assemblies has increased dramatically and with that, challenges to cleaning have also increased. Because cleaning is commonly an “end of the line” procedure, it frequently falls victim to assembly procedures earlier in the assembly process. As a result, cleaning technology (equipment, chemical, processes), must be reactive to overcome the challenges presented by the assembly process. Today, we’re going to discuss some of the challenges to cleaning and to do so, I’ve recruited a panel of experts. Today’s cleaning roundtable features a number of experts from Zestron, a company known for manufacturing innovative chemical solutions for the electronic assembly and semiconductor markets. In The Screw-Ups, we talk to experts in electronics manufacturing about specific problems they’ve encountered and offer up potential solutions. Tim O’Neill has nearly 25 years experience with solder materials, primarily with AIM Solder, where he is currently technical marketing manager. He explains the nature of soldering residue at the rework station, and steps that can be taken to mitigate it. Mike Konrad has known Phil Zarrow and Jim Hall for many years. Phil, Jim, and what they describe as their brothers, operate ITM Consulting, a consulting and advisory firm for the electronics assembly. Phil and Jim also produce a question-and-answer program, answering technical assembly-related questions in an equally valuable and humorous manner. As you will hear, Phil and Jim, while taking their customer’s problems seriously, don’t take themselves too seriously, which is one of the things Mike loves about them.